Fatima Memorial Hospital (FMH) was born out of a tragic history of personal bereavement. Maulvi Feroz-ud-din, a prominent scholar, lost his young wife, Kaneez Fatima, during childbirth in 1917, due to a severe lack of adequate medical facilities. In 1944, he founded the Ferozsons Trust with an initial cash endowment along with all the proceeds from his books. The aims of this Trust were to provide quality medical care to the under-privileged of society on a non-profit, self-sustaining basis and to promote the education and social development of the community. The fulfillment of this vision began in 1971, when his son and daughter-in-law, Dr. Abdul Waheed and Begum Saida Waheed donated all their assets towards the construction of a hospital for women and children. In 1977, it started as a 200 bed community hospital for women and children care. By the Grace of God Almighty in the year 2000, Fatima Memorial Hospital transformed into a 470 bed multi-specialty tertiary care teaching hospital. Fatima Memorial Hospital believes in service excellence and quality health care to the ailing humanity. Core philosophy of functioning of Fatima Memorial Hospital is cross subsidization where funds generated from affording patients are utilized for the benefit of underprivileged and indigents. Today FMH stands committed to provide quality health care services to all categories of patients disregarding means to pay. 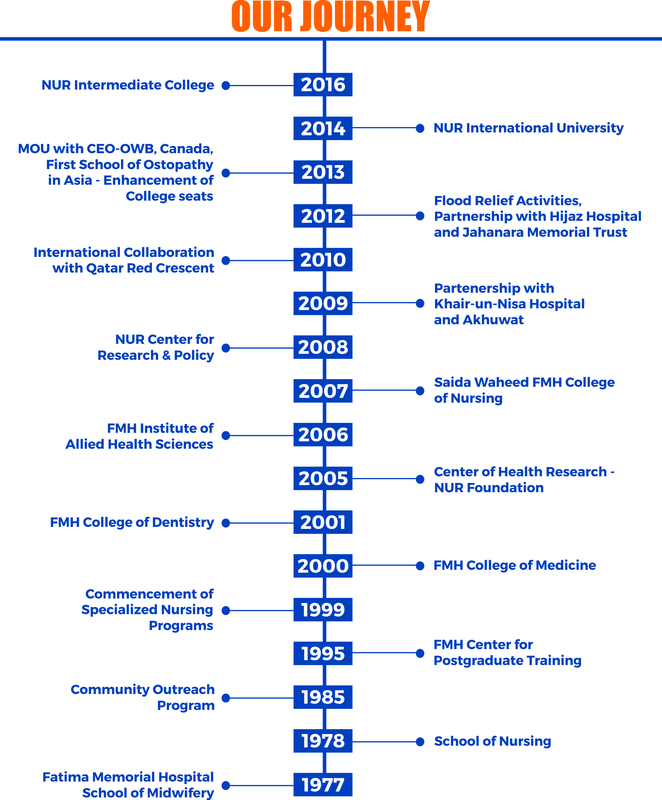 The hospital today serves not only as a hub for patients, but also as the teaching base of all human health resource which includes the FMH College of Medicine and Dentistry and for FCPS, MCPS, MD & MRCGP training of postgraduate trainees, FMH Continues to be a practice base for nurses trained at the Saida Waheed FMH College of Nursing. The hospital also continues to act as a referral center for patients treated by the mobile health service.